This result is full of interest, and goes far beyond the standard model in which m(r) = 1 – r0 / r , a restriction imposed by the obsolete Einstein field equation. In order for m(r) < 1 in the standard model, the requirement MG > r c squared would be imposed. In the m(r) theory the possibility of an expanding orbit could be looked for in astronomy. it follos gamma=0 which leads to divergence in the equations of motion. At this “event horizon” total energy and angular momentum are undefined. 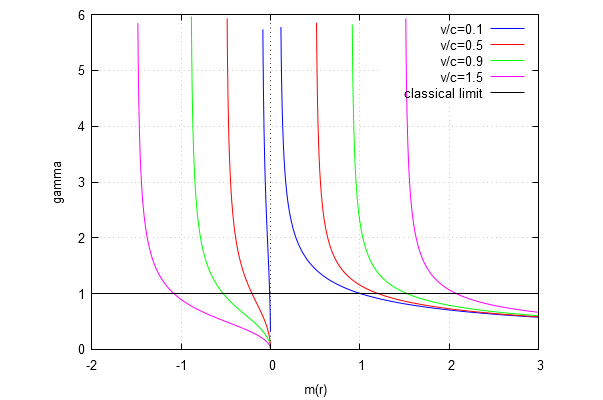 gamma factor leads to a quite different behaviour for m>0 and m<0. expanding. I will check this numerically. This entry was posted on November 2, 2018 at 3:06 pm and is filed under asott2. You can follow any responses to this entry through the RSS 2.0 feed. Both comments and pings are currently closed.